I know what you’re thinking. Because it was my first thought, too. They make wine in Azerbaijan? Isn’t Azerbaijan a Muslim country? Yes. According to the CIA Factbook (so you know it’s true), Azerbaijan is 93.4% Shi’ite Muslim. And isn’t alcohol kind of a no-no in Islam? Yes. Alcohol is forbidden in Islam. And yet . . . they make wine in Azerbaijan. That’s a bit of a head-scratcher, isn’t it? Recently, I had the opportunity to taste not one, but two varieties of Azerbaijani wine (more swag from my dad’s business trips). But before I get to the wine, let’s get tangled up in a little history and see if we can get to the bottom of this. Azerbaijan is the largest country in the Caucasus region of Eurasia. It’s on the western side of the Caspian Sea, across from all the ‘stan countries. Azerbaijan isn’t the greatest piece of real estate ever — it’s neighbored by Iran to the south, Russia to the north, and Armenia & Georgia to the west. Apparently, the Azerbaijanis aren’t wild about any of their neighbors, but they especially despise the Armenians. If you ever find yourself in Azerbaijan, you should NEVER bring up Armenia in conversation. It won’t end well. Officially, Azerbaijan is a secular country (I know, I had to read that twice, too). Even though 93.4% of the Azerbaijani people identify as Shi’ite Muslim, they take more of a cafeteria approach to Islam — and only loosely observe the Islamic prohibition of alcohol. Drinking wine is permitted, and very few women wear a veil (sort of a non sequitur, but interesting). Before the Communists took over in the 20th Century, Azerbaijan had a thriving wine industry dating back over 2,000 years. Well, it was thriving in the sense that they supplied thirsty Russians with tons of poor quality wine (you know, for when they ran out of vodka). I’ve read some articles supporting the idea that Anatolia and parts of Azerbaijan are the birthplace of viticulture. So the roots (literal and figurative) are there. By 1985, Soviet leader Mikhail Gorbachev decided Russians drank way too much, and declared war on alcohol. Vineyards were ripped up all over the Soviet Union and its satellite republics. Seriously, Gorbie? Did you skip class the day they covered Prohibition in your US History class? We tried that — it didn’t work. Predictably, alcohol consumption decreased slightly, but bootlegging and organized crime increased. So the war didn’t last long. Since Azerbaijan’s independence in 1991, efforts to revive and modernize the wine industry have been brisk. Most wineries in Azerbaijan are situated in the northern part of the country, along the remnants of the Silk Road (the ancient trade route between the Mediterranean and China). Wines made from grapes (as opposed to wines made from pomegranates or mulberries — which are also made) are called şərab. Azerbaijan makes wine from international grape varieties (Pinot Noir, Pinot Blanc, Cabernet Sauvignon, Rkatsiteli, Aligote) as well as some indigenous varieties (Derbendi, Bendi, Zeynabi and Marandi). 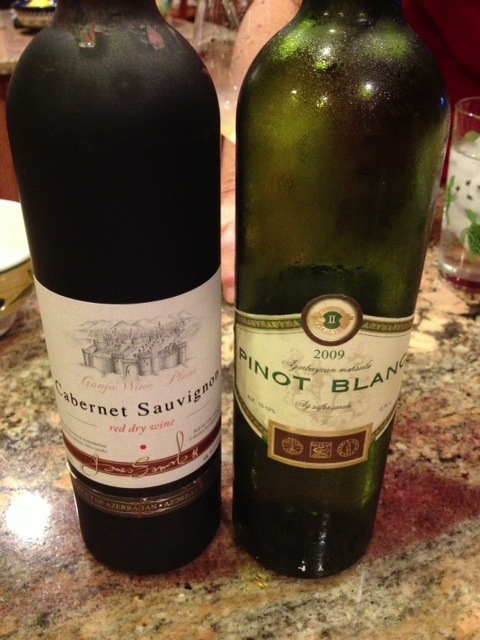 I tasted a NV Cabernet Sauvignon and a 2009 Pinot Blanc. My expectations were on the lower side of low, but you know what? They weren’t awful. The problem with Azerbaijani wine labels is that they are written in Azerbaijani . . . which is waaaay outside of my linguistic comfort zone. So if you’re hoping for more information about the wineries, you’re out of luck. Sorry. Surprisingly OK. Light-bodied, not terribly complex. Flavors of apricot, lemon and petrol. Very Riesling-esque. Light, crisp and clean. No complaints here. We didn’t have any problems finishing off the bottle. Again, surprisingly OK. Nose is vanilla and banana. A highly tannic wine, with flavors of brick, and smoke on the back end. Azerbaijan sits on an enormous cache of oil fields, and I swear I can taste a little petroleum in my glass. Not a mind blowing wine, but I’ve had far worse Cabs from far more renowned wine-growing regions. Grapes have been growing in Azerbaijan since before the birth of Bacchus. The wine industry got thrown off track a little by politics and religion, but they are on an upswing once again. As always, I’m grateful for the opportunity to taste a little corner of terroir I wouldn’t normally have a chance to taste . . . or visit. P.S. This is a total non-sequitur, but I have to share it with you because I read it over and over again while researching this post: If you’re ever a guest in the home of an Azerbaijani, you should always bring flowers. But be sure to bring an odd number of flowers — even numbers of flowers are reserved for funerals. And now you know . . .
Who would know, certainly not I! Very interesting, great post. Thanks, Suzanne! I had NO idea until I started researching this post. It was fun learning about Azerbaijan and their wine! Salud!! I’ve become very interested I wines from countries not usually known for their wines yet have a long and proud history of making wine, and especially moreso if they have unique grape varieties. So thank you for this write up about Azerbaijan, I was not aware! And I now know to bring flowers when I am a guest .. what was that … an even amount? God, I love to have the experience of tasting wines from unusual places (unusual for us, not for the place). I mean, Georgia is said to have been the cradle of old wine making. Always wanted to try some their wines. I agree! I’d love to get my hands on some Georgian wine. I’ll have to put a bug in my dad’s ear . . . you never know! Prost, Oliver! !